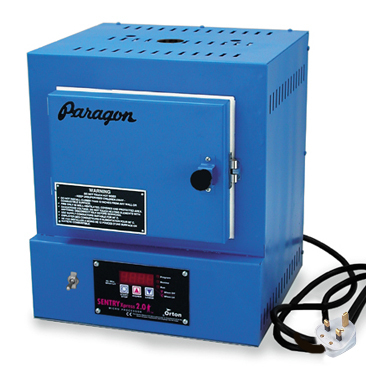 The digital electric SC-2 kiln fires silver art clay, decals or transfers, china paint, enameling, and glass in minutes up to 1050°C The SC-2 is popular with seminar teachers and hobbyists because it fires fast, plugs into a standard 13amp, 240 volt household socket. The basic SC2 has been in production since 1997. It is a proven design that Paragon Kilns have steadily refined every year. Thousands of artists in the U.S., Canada, Europe, and Japan love their cherished SC-2. Just 3 buttons on the simple to use computer give you amazing control over a wide range of firing times and temperatures. It fires automatically at the rate and temperature you enter. A large, brightly lit display prompts for firing rate, temperature and hold time. Use the hold feature to automatically soak any type of clay silver to its recommended time. The fast-firing element is embedded in the firing chamber shell. The SC-2 heats from the sides and back. Each kiln includes a 1/4” thick ceramic fiber shelf. Why is a ceramics company selling a glass/ silver kiln? Hobby Ceramicraft are the original Paragon kiln stockists in the U.K. having sold large numbers of ceramic kilns here over the years. We also host the Paragon kiln service and maintainance seminars in the U.K. of a fairly regular basis. We ship our kilns in quantity by sea in 20 and 40 foot shipping containers. This means we can add a few small glass or silver clay kilns into the container at a very low freight cost per kiln. We pass this saving on to the customer, making the sc2 an extremely well priced model. Note also; we always include a furniture kit in our price. Design programs with up to 8 segments (steps) in Ramp-Hold mode. Fire to a single temperature at a single speed in the simplified Single Segment mode. Ramp-Hold mode can store 4 programmes. Skip Segment feature in Ramp-Hold mode Temperature hold The Sentry Xpress can control both heating and cooling. Program Review lets you check that the program you are about to fire is correct. Temperature Display throughout firing and cooling in your choice of °F or °C Error Messages report mechanical problems such as a disconnected thermocouple, stuck relay or broken element. 12 Month Warranty LED Lights show whether you are in program, review, or firing mode. Specially designed cartons and foam padding assure that the kiln should arrive safely.